Alumico's new vinyl storm door line is our best selling storm doors. The new era of storm doors, this vinyl door is more energy efficient than any aluminum door.Pre-hung, with aluminum z-bar heavy duty hinges, and heavy duty hardware. the vinyl storm door is the best and most cost effective door on the market today. 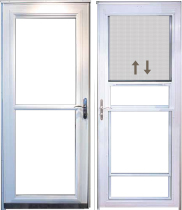 Made with uPVC that meets ASTM standards and is AAMA certified, the vinyl door has fusion welded corners, heavy duty galvanized steel reinforcement, fully adjustable multi fin sweep, and is pre drilled for standard hardware, making this door easy to install.